Kia's concept cars are really gorgeous, take this Koup Concept of theirs and their previous Kia Kee Sports Concept Car. So why is it that their designs never make it to their real cars? This new Koup Concept car of theirs which was unveiled at the New York Auto Show screams high tech and sporty. Most notable about the Kia Koup Concept car is the greenhouse-integrated panoramic view glass. The glass panels extend from the windshield through the roof. 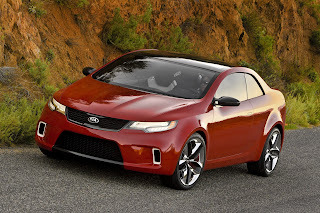 The Kia Koup Concept is powered by a 2.0 liter Theta II turbocharged engine which produces 290 horsepower. It also has a GDI twin scroll turbocharger had produces torque of 289 lb-ft.
No word if this will ever make it to production.